My favorite thing about the cards this year is that my son helped with them. 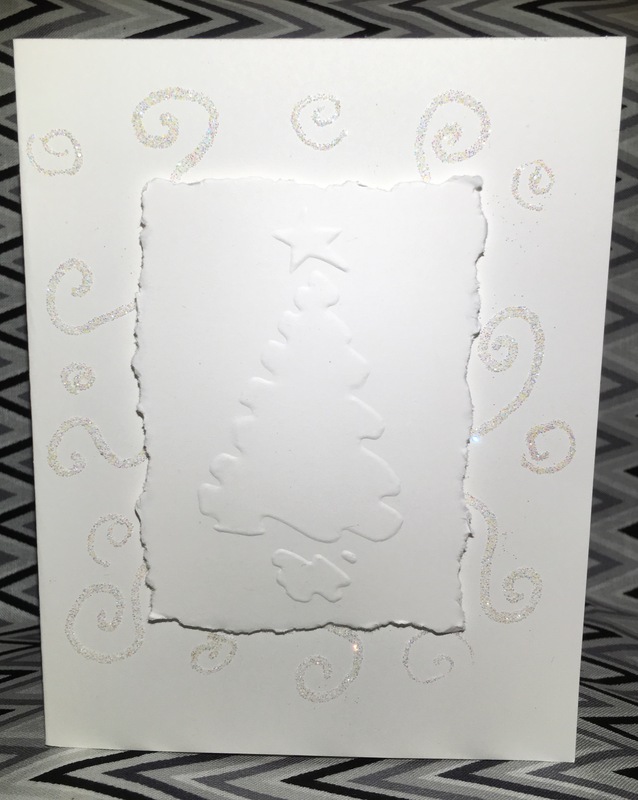 He embossed all of the trees for me and did great job. I love making our Christmas cards every year, and having him help made it that much more special this year. The other great thing about this card design is that it was pretty simple to make. The embossed panel was cut to be about a half inch larger than the stencil then about a quarter inch was torn off each side using a tearing edge (at first I thought this was a silly tool, but it quickly became one of my favorites). Then on the main card I drew swirls with glue pens and put glitter on them. Once they were dry, I used Stampin’ Dimensionals to raise the panel from on the card. Easy peasy. Beautiful. I love the simplicity of using one color. I enjoy doing that in my quilting and embroidery. There is just something peaceful about it. Thank you. This definitely felt peaceful making it. I thought you were choosing a Beatles theme until I read your description. I like how it turned out, and I love that you and your son made them together. Good memories! That is awesome! Hadn’t thought about the Beatles. Thanks!